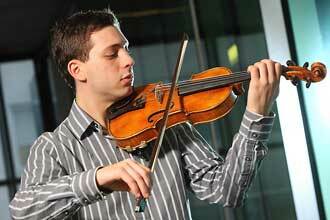 The Schulich School of Music’s Golden Violin Award for 2009-2010 goes to violinist Aaron Schwebel. The 21-year-old undergraduate is the fourth winner of the $20,000 award, presented annually to a top McGill string player who is close to completing studies and has shown the potential for a successful performing career. Schwebel is in the final year of his Bachelor’s Degree in Performance program, under the tutelage of Prof. Jonathan Crow. He is also a co-founder and co-director of Chamber Music Without Borders, a student-run outreach program that brings live classical performances to community institutions in the Montreal area. The award will be celebrated Feb. 9 at the annual Bravo event honouring McGill researchers; Schwebel will perform the Preludio movement from the Bach Partita No. 3 during the event. He’d also like to put some money aside to pursue his ultimate goal: launching a professional string quartet. interact with young musicians,” Schwebel said. The group also stages performances at three seniors residences and conducts children’s workshops. Other members of the outreach group are violinists Mira Benjamin, Laura Horn, Julia Loucks, Amy Hillis and Sarah Frank. The Golden Violin Award was provided in 2006 by businessman and philanthropist Seymour Schulich, the year after he donated $20 million to the School of Music. Made of pewter and gold plate, the Golden Violin remains on permanent display in McGill’s Marvin Duchow Music Library. The award recipients receive a smaller likeness in the form of a 14-karat gold lapel pin. The three previous winners are violinist Emmanuel Vukovich, violist Lambert Chen and cellist Chloé Dominguez.